Come by CRYSTAL Books and Gifts for another weekly “Off The Shelf Author Series” on Thursday evenings during the Downtown Farmer’s Market. It is free to the public and is a great opportunity to meet local authors while enjoying informative and entertaining presentations by them. On Thursday, September 14th, from 6pm to 7pm, the store will be hosting Local Author, Adrianne Wagner. Author Adrianne Wagner, MA, NCC, will discuss her recent book, Creative Chameleon Finds Acceptance: A story for gender self-identifying kids that encourages readers to love and accept themselves and others, regardless of their differences. The story promotes embracing who and where we are, while discovering our own unique purpose on our life’s journey. 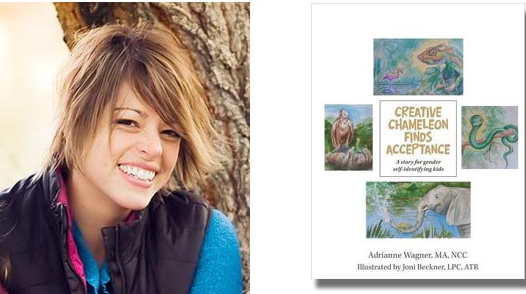 Adrianne has also authored of a series of grief books that were created to help children and adults cope with thoughts and feelings when dealing with illness and/or death. Adrianne specializes in grief work and working with people in life or spiritual crisis. She approaches her client’s needs through treating the whole person; mentally, physically, emotionally and spiritually. She believes a person can access their own inner wisdom to come to conclusions for their greater good. Adrianne’s work in this field comes from her own personal experience of losing a child in 2004, resulting in a spiritual shift in her life. Adrianne is the owner of BLOOM Counseling Services and has worked in the mental health field since 1998. She earned her Master’s Degree in Community Counseling in 2008 and is a member of the National Board of Certified Counselors and is a Nationally Certified Counselor (NCC). She works part time at HopeWest & Hospice in Grand Junction, CO.
Join us at CRYSTAL Books and Gifts at 439 Main Street in Downtown Grand Junction. Take a break from the hot temperatures on the street and drop in for a few minutes or the entire hour. Seating is limited. You are encouraged to visit CRYSTAL Books and Gifts’ website at crystalbooksandgifts.com and sign up for the email newsletter. You may also call the store at 970-242-5181. More information about this event can be found online at crystalbooksandgifts.com and clicking on upcoming events.